Music Series begins Sunday, June 26th at 2 PM. Karass was formed years ago for the specific purpose of playing in the Masonic Cemetery’s then new music series, Music To Die For. 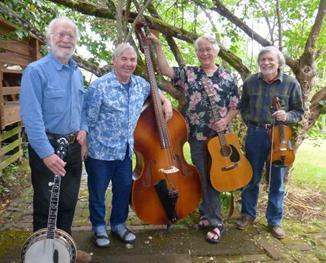 While they indeed played in Hope Abbey, the group continued to live on and have made many subsequent appearances in the Eugene/Springfield area. Alas, this June 26th appearance will probably be their last as one of the members is moving on to other interests. This may very well be your last chance to hear this talented group. Karass (A term created by author Kurt Vonnegut in Cat’s Cradle) means “A network or group of people who are somehow affiliated or linked spiritually.” What it means in our case is an acoustic folk band with a focus on vocal harmonies. Come join us. All MTDF programs are held in Hope Abbey Mausoleum on the grounds of the Eugene Masonic Cemetery, 25th & University, and begin at 2PM. Seating is limited so please arrive a bit early. All programs are free. June 21, 2016 in Community Events.